The great spiritual friend of the true meaning of Dharma, Karma Legden, also known as Exalted Senge, was born in 1929 in Katang of Lingtsang, a district of Dhokham in Tibet. His father was Norbu Wangchuk and his mother, Zhelha. From a young age he naturally possessed innate qualities of faith and compassion. As a young teenager he visited Palpung Thubten Chokor Ling together with Nyatrul Nyima Rangshar. There he received many empowerments, reading transmissions, and instructions from both Situ Pema Wangchuk and Dzongsar Khyentse. For a while he acted as treasurer to the Exalted Nyatrul, the one with vast knowledge of the two traditions*. Everyone in the region held him in high regard. Several circumstances combined to cause a definite desire to leave samsara; hence he took ordination from Khenchen Karma Thubten and received the name Palden Tsultrim. Through offerings, service, and practice**, he tended his lama, Lama Tsepal of Yartob, who had committed himself to life-retreat; thus he received empowerments, reading transmissions, and pith instructions for both the Sutras and Tantras. 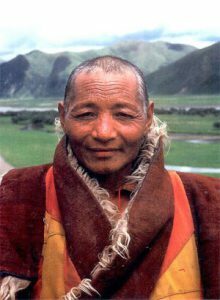 Having reflected upon them, his being became filled with excellent qualities; in particular he developed complete power of realisation in the meditation of the Great Perfection (Dzogchen), and he became his lama’s supreme heart-son. Occasionally he would offer his realisation and discuss liberation with the Lord of Realisation, Nyima Gyalo of Gotsa. Lama Senge was a wholehearted renunciate and spent most of his life on isolated mountainsides in retreat, engaged solely in the equipoise of meditation. In that vein he passed into the dharmadhatu whilst in retreat, at quarter past four on January 23rd of 1993. Although this Lama’s activities of body, speech and mind were inconceivable this story of liberation was written as an introduction for beginners, by Drupon Khen Rinpoche Karma Lhabu in 2012, at Samye Ling Monastery in the UK and translated into English by Karma Kunga. For a more detailed account please refer to his extensive story of liberation. *The two traditions are the traditions of the world and the traditions of Dharma.